There’s no doubt that the upcoming election has everyone’s attention. With Hillary and Trump standing as polar opposites of each other, the outcome is sure to leave half the nation bitter and disappointed. However, according to HSBC’s Chief Precious Metals Analyst James Steel, there is one group who will be pleased regardless of who wins: gold owners. As election night draws closer, Steel shared his bullish forecast and explained why both candidates will end up boosting gold in a significant way. Although widely viewed by the mainstream as being the less risky scenario, Steel asserts that a Clinton win would reaffirm HSBC’s already bullish outlook and drive prices to $1,400 an ounce by the end of 2016. 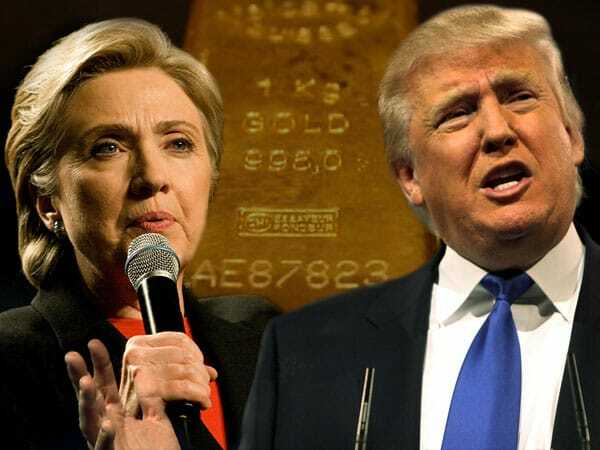 Aside from renegotiating longstanding free trade trade agreements, Hillary could also bring about a shift to protectionism, boosting demand for gold as “protection from protectionism”. Should Democrats also take back Congress, Steel says demand would spike further amid a likely increase in fiscal spending – thus making HSBC’s forecast for gold in 2017 even more bullish. Could Trump be even better for gold? Aside from increased protectionism, Trump is also expected by some in the mainstream to usher in higher budget spending and increased geopolitical risk. Because of this, Steel expects a Trump win will boost gold not just in the immediate aftermath but through the following year as well, predicting that gold could rise to $1,575 by the end of 2017. ETF Securities’ head of research and investment strategy James Butterfill echos Steel’s forecast, saying that he expects gold to rise 10% within a year of Trump in office. Butterfill named policy uncertainty and a potential rise in inflation as the main causes of a spike in gold prices post-Trump win. After observing the swings in gold prices that followed 22 presidential elections since 1928, Butterfill noted that shifts in the administration have historically benefited the yellow metal, adding that the Trump’s criticism of the Federal Reserve suggests more uncertainty than any president has brought in generations. With polls tightening in recent weeks, only one thing seems certain: while the outcome is bound to leave many people disappointed, gold owners won’t be shedding any tears in the near future.